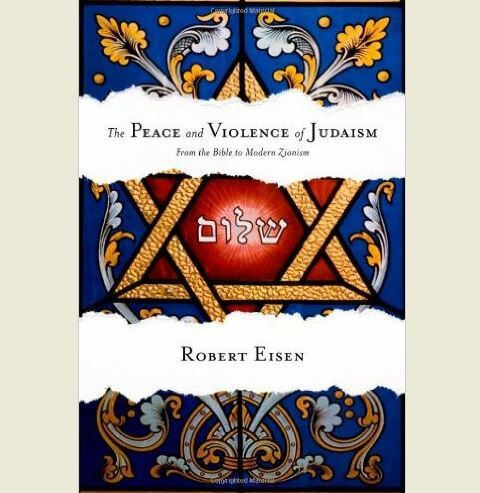 In each chapter, Eisen presents the case that a given set of texts advocate peace, and the case that they advocate violence. This style is reminiscent of Talmudic debates and is very effective, as it allows to reader to see the proofs and refutations of both sides and decide for himself which is closer to the truth. It is difficult for an Orthodox Jewish organization like ours to review the first half of the book, which deals with the Biblical, Rabbinic and medieval periods. Aside from the debate Eisen presents, Orthodox Jews will take issue with many basic assumptions in the book. The book assumes an independent standard of morality by which G-d's actions and commands can be judged. It assumes that the Bible is the product of human authors rather than G-d. It assumes that the Talmudic rabbis and medieval scholars had their own agendas and were interpreting earlier teachings accordingly. By contrast, we believe that G-d alone wrote the Torah and that morality can only be defined as G-d's will expressed to humans. We can no more pass judgment on His commands than we can pass judgment on natural disasters brought about by Him. We believe that the Talmudic rabbis merely put into writing an oral tradition originating at Sinai, and that medieval scholars like Maimonides and Nahmanides exercised complete intellectual honesty when interpreting the Torah and Talmud. A good case in point is Phinehas's zealous slaying of Zimri in Numbers 25. In his section on the Bible (p. 32 and p. 58), Eisen presents this as an example of license to take violent action even when not explicitly commanded to do so. He then states (p. 33) that the rabbis emulated Phinehas by issuing a ruling in the Mishnah that one should kill a Jewish man who commits a crime similar to Zimri's. Actually, Orthodox Jews believe that this cause and effect are reversed. The law that a zealous individual should kill someone committing this crime was given by G-d to Moses at Sinai. Phinehas was simply putting G-d's law into practice. Thus, his action cannot be seen as a license for violence not commanded by G-d.
"The biblical narratives describing the Canaanite conquest treat war as G-d's prerogative, not Israel's... whenever holy war is waged in the biblical text, it does not spring from human initiative. It is G-d who wages war, and it is He who is responsible for ensuring that Israel achieves victory. The Bible therefore does not endorse holy war as a normal human activity, but only as an activity practiced in exceptional circumstances when G-d explicitly permits or commands it. Because this concept of war insists on minimal human involvement in war, it represents, in effect, an ideology of nonviolence." "First, the rabbis believed that the second Temple was destroyed and the Jews forced into exile because of their sins. This notion was eventually encapsulated in the phrase mipney hata'einu, "because of our sins," which appears in the festival liturgy. Second, the only way Jews could repair their relationship with G-d was through repentance, which was equated with the strict observance of Halakhah. Third, if the Jews fulfilled this condition, G-d would send the messiah, punish the nations that had oppressed Israel, and lead the Jews back to their homeland to regain sovereignty and rebuild the Temple. Finally, in the meantime, patience was needed; Jews should focus their efforts on repairing their relationship with G-d through the observance of His laws and not to dwell on messianic speculations that might lead to more self-destructive violence." "Let us round out this discussion by looking at religious Jews who reject not only militant religious Zionism, but Zionism altogether. A substantial number of ultra-Orthodox Jews fall into this category. They believe that redemption must come solely through G-d's initiative and that Jews can hasten the redemption only by observing G-d's commandments and having faith in Him. The establishment of the state of Israel is therefore blasphemous because it established Jewish sovereignty in the Holy Land through human initiative and is secular in character. This criticism applies not just to secular Zionism but to religious Zionists as well. The latter also lack the necessary faith in G-d, as evidenced by their attempt to force the redemption... a good portion of ultra-Orthodox Jews remain opposed to the very existence of the Jewish state. "What is key for our concerns is that ultra-Orthodox anti-Zionists are nonviolent when it comes to Palestinians and Arabs. In fact, many of them believe that the biblical land of Israel should be governed by Palestinians, who are the rightful owners of the land, until the messiah comes. Secular and religious Zionists often vilify ultra-Orthodox anti-Zionists for their views and brand them as extremists, and yet in many respects this group represents a viewpoint that is well grounded in Jewish tradition. That certainly seems to be the case with respect to their views on violence. In our chapter on the Bible, we argued in our second reading that biblical narratives involving war could be interpreted in a nonviolent manner because they assumed that G-d initiated war, not human beings. In our discussion of rabbinic Judaism, we saw a similar emphasis. When the rabbis described the vanquishing of Israel's enemies in the messianic period, G-d waged war, not human beings. Thus, ultra-Orthodox anti-Zionists are on firm Jewish ground when they claim that it is G-d who can use violence to reestablish Jewish sovereignty in the land of Israel but human beings must not. Ultra-Orthodox anti-Zionists also give a plausible reading of the Talmudic passage involving the three oaths when they interpret it to mean that Jews must not establish a sovereign Jewish state in the land of Israel before the coming of the messiah. Therefore, however eccentric this group of ultra-Orthodox Jews may appear to most Jews, their commitment to nonviolence vis-a-vis Palestinians and Arabs is very much within the parameters of the Jewish tradition." "called on Jews to begin the process of emigration to Palestine and the formation of agricultural settlements in preparation for the messianic era. At the same time, they insisted that the redemptive process be conducted without violence. According to Alkalai, this was the meaning of the oath in the well-known Talmudic passage in which the Jewish people promise 'not to ascend the wall'... According to both Alkalai and Kalischer, a second oath in the same Talmudic passage, in which the Jewish people pledge not to 'rebel against the nations,' meant that Jews should go to Palestine only with the consent of the gentile nations." "Reines's Zionism was nonviolent... the purpose of Judaism, according to him, was to cultivate the culture of the Book, a culture that was moral and spiritual, and to oppose the culture of the Sword, the culture of violence in the non-Jewish world... Reines was thus opposed to military activism as a means of achieving the goals of Zionism. He too interpreted the Talmudic passage about the three oaths in light of his outlook. In his opinion, the passage taught that Jews should not engage in the use of military force before the coming of the messianic period." Perhaps most eye-opening of all is Eisen's description (pp. 188-189) of the true views of Rabbi Abraham Isaac Kook, whose theology inspired the creation of the radical wing of religious Zionism. "In fact, Kook's Zionism was decidedly nonviolent, as we have already mentioned, and it was only by distorting his views that his followers were able to use them to justify violence. Kook believed that in the emerging messianic age, Jews would exert influence on the world through the holy life they would lead in the land of Israel, a life synonymous with the observance of G-d's commandments, and he explicitly ruled out the use of force of any kind in accomplishing this goal. Jews had fought wars in the biblical period only because it was a violent era, and they had to do so in order to survive, but that age had forever passed, and wars were no longer needed. Moreover, as we have just noted, Kook believed that the Jewish exile had a beneficial effect in preparing Jews for political life by inculcating in them moral sensitivity and antipathy toward the use of force. Kook's non-violence was evident in his understanding of the Talmudic passage regarding the three oaths. Kook believed that these oaths applied to the messianic age, not just to the period of the exile. Therefore, even in the messianic era, Jews were not allowed to 'ascend the wall' - that is, to use force to reoccupy the land of Israel." "Some of the key ideas of the younger Kook also provide excellent examples of how nationalism distorted traditional Jewish teaching... the younger Kook's use of Kabbalistic metaphysics to justify the use of military force to bring the messianic redemption can also be judged as tendentious... There was no real precedent for using Kabbalistic thinking in this way... Religious Zionists, however, have been consistent in their unwillingness to admit their modernism, and they maintain that self-deception by justifying their thinking on the basis of ideas and texts drawn from the tradition, as if their values have always been those of Judaism." "During his lifetime not a single halakhic authority publicly supported Kahane's views... Kahane was a one-man show who never saw the need to argue for his positions and who rejected the views of his opponents by simply pushing them away with venomous attacks and threats." "Religious Zionism also coopted into their thinking the modern notion that human initiative and activism shaped history. Thus, in Kookian Zionism, messianic redemption would come only if Jews actively sought to establish a Jewish state. These observations partly explain why religious Zionists had difficulty getting the support of the Orthodox community when the Zionist movement began to take shape. The wedding of religion and nationalism was considered revolutionary by Orthodox Jews. The same goes for the notion that messianic redemption depended largely on human action. While messianism was a central principle of faith in Judaism, it was much harder to justify the notion of a return to the land of Israel as a central tenet of Judaism in its own right before the advent of the messiah." In conclusion, we applaud the above passages of Robert Eisen's book as a sober view on the stark contrast between modern Zionism and Jewish tradition, putting anti-Zionist Orthodox Jews in their proper place as the true bearers of Biblical and Rabbinic Judaism. It is our hope and fervent prayer that as Jewish demographics shift and secular Zionists lose interest in their movement, anti-Zionist Orthodox Jews will emerge as the dominant force within Jewry and bring a peaceful end to the Zionist experiment.